To install your PSQL Client, run the Setup.EXE program from this directory. If you need to purchase a copy of PSQL, please contact your Elliott reseller to obtain an OEM version of PSQL for Elliott. If you are evaluating Elliott Version 7 and do not have the PSQL Engine, you can download a trial version from Pervasive’s website: www.pervasive.com. In this documentation, we are using the words PSQL, Btrieve and Microkernel Engine interchangeably. Insert the CD-ROM and the setup should launch automatically. If not, click the start button on your Windows desktop and select run. Type D:\setup.exe and press Enter. If the CD-ROM drive is a different drive letter other than D:, enter the correct drive. The default installation directory is C:\ELLIOTT7, but this is optional. If you need a multi-user installation, install Elliott on a network drive to let all users share a common Elliott directory such as F:\ELLIOTT7. Please make sure all users are mapped with the same drive letter for Elliott. Installing Elliott to a network drive will minimize support, update, and upgrade efforts in the future. Elliott V7 may run in the same directory as Elliott V6.6 and V6.7. All programs and library files in V7.0 are independent from V6.6/V6.7 and the files do override each other. Since all Versions share the same database structure, you can have both versions running at the same time from the same directory. For network installations, there are no clients (DLLs) that need to be installed on the workstations for Elliott. Setting up a workstation to work with Elliott is a simply a matter of setting up an icon on the desktop. 1. Typical: This will install all components on the CD to your selected directory. This includes Elliott program files and tutorial database. 2. Compact: Currently, this option is the same as the Typical Option. 3. Custom: Pick and Choose components to install. If you are upgrading from a previous Elliott version, use this option to only install the Application Files without the tutorial database. During the installation process the default folder is Elliott7. If you wish to change or rename, you can do it here. · Elliott V7 – Start Elliott. If you need to run a second session of Elliott, simply click this icon again. Mass E-Mail: Launches Elliott Mass E-Mail program. This is an independent program that uses the Elliott eContacts program as its database. Export Processor – This function is used to export certain master files to either comma or tab delimited format. You can launch Excel directly from this application to bring up the data you export. You may also use this function as a simple report writer. Tickler – Although integrated with Elliott software, users can start the tickler tracking program independent of Elliott. · Elliott Configuration – You can use this utility to configure global flags that apply to all users that share this installation. If you do not configure Elliott first, when you startup Elliott for the first time, the system will automatically launch this configuration utility for you. Convert From RealWorld V8.x – This is a conversion utility that will convert existing RealWorld 8.x data to Elliott Version 7. When you close the Elliot Folder window, (previous page), created during the installation process, you will be taken to the final installation screen as shown below. Without a Registration File, Elliott works in Demo Mode with certain limitations. 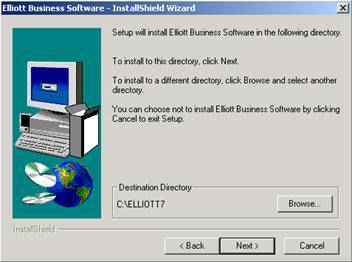 After the software is installed and if you have a registration diskette from NETcellent, you will need to copy the Registration file to your startup root directory, (Directory Elliott was installed to). To copy, you can use Windows Explorer, Windows Run or DOS command of COPY A:\*. * X:\ELLIOTT7 (Drive and directory installed to). ELIREG70.TXT - Text file indicating what features you are licensed for. To add Elliott users on the network, make sure PSQL 2000 Client or Workgroup Engine is installed on their workstation. à Make sure all users are mapped to the same network drive. All workstations can share a common network directory for the Elliott program files. This is very helpful when there’s an update or upgrade for Elliott since the update only needs to be installed once and it applies to all workstations. Elliott provides the ability to run multiple sessions of the application software while only using one user license. For example, you may start a stock status inquiry while you are in a COP add orders session. Moving around multiple sessions is simply a matter of switching, (ALT-TAB), to different windows. This means you do not have to exit the order entry screen to handle a customer call regarding stock availability. To explore Elliott, click on the Elliott V7 icon. By default, passwords are not turned on and you will be logged in as SUPERVISOR. If you chose to install our tutorial data, the database “Elliott Demonstration Company” was installed for evaluation and training purposes. When you are ready to start building your live data, create a new company from the company selection screen.